CitizenRE - Solar Snakeoil Salesmen? In taking the action Monday, Oregon, Washington, California, Arizona and New Mexico build momentum for a national strategy to control carbon dioxide and other gases that contribute to global warming. States are increasingly pressing forward on their own amid inaction by the Bush administration and Congress. Capping emissions from fossil-fuel burning power plants could also push energy companies toward wind and other renewable energy. Gov. Ted Kulongoski helped broker the five-state deal and signed onto it Monday with the governors of the other states. The compact "sends a message to Congress and the White House that if they fail to enact policies at the national level to reduce greenhouse gas emissions and do our nation's part to combat global warming, that states will do it on their own," Kulongoski said. Each of the states in the western strategy was already acting on its own to address global warming. All the governors who signed the agreement are Democrats, except Gov. Arnold Schwarzenegger of California. The strategy has potential to grow to include other states and British Columbia, which has invited West Coast states to join its efforts, said David Van't Hof, an adviser to Kulongoski. He said a primary goal of the strategy is to motivate the federal government to act, and to protect the interests of Western states if it does. "Rather than wait for them to act, we're trying to influence where it's heading," Van't Hof said. The western effort is the second broad regional move to address global warming. Nine Eastern states have already joined to limit emissions from power plants only and create a cap-and-trade system for the plants to buy and sell credits they get for reducing emissions. The Western states strategy is general and does not specify how the states will control greenhouse gases. But they will target all the major sources: vehicle exhaust and industrial sources as well, according to the governors and their aides. To start out, the states will set goals for slowing the growth of greenhouse gas emissions and then cutting them back. Then, within 18 months, they will establish a strategy for reducing the emissions. One option is a cap-and-trade system that limits carbon dioxide released as electricity is generated. It would require utilities that sell electricity in Oregon, for instance, to control the resulting carbon dioxide. If they cannot control it, they might instead buy credits from those that do. Utilities could also fund programs to offset their emissions by planting trees to soak up the gases, for example. Emissions limits would probably also extend to vehicles in some form, since they produce about a third of carbon dioxide released nationwide. Oregon has already adopted stricter tailpipe standards that reduce vehicle pollution and emissions. Limiting power plant emissions will probably push electricity prices up a few percent or more as power companies pay for the controls. But a draft strategy developed in Oregon would channel more money into making homes and businesses more energy efficient, so they would burn less power overall and their bills might decline. "You're either behind the curve or you're ahead of it, and this puts Oregon ahead of it," said Jason Eisdorfer, an attorney with Citizens' Utility Board of Oregon. "Oregon is not going to solve global warming itself, but these five states together can make a significant contribution." Depending on the approach, the Legislature would probably have to approve greenhouse gas controls. California has already instituted tough limits on carbon dioxide and is talking with the United Kingdom about combining forces in a joint strategy. 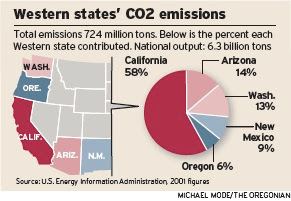 The Western states that joined the strategy Monday together emit about 11 percent of all carbon dioxide nationwide. Experts said that by itself shows that the effort must expand if it's going to have much hope of heading off global warming. "Even the U.S., by itself, isn't going to deal with this problem," said Mark Trexler, president of Trexler Climate + Energy Solutions, a Portland consultant who helps companies prepare for global warming regulations. Power company officials said Monday they hope the Western states' strategy paves the way for a national system to control greenhouse gases. They said they would prefer a nationwide program to a complicated web of state and regional strategies. "It would be nice to have something consistent," said Bekki Witt, a spokeswoman for PacifiCorp, which operates and buys power from 14 coal and natural gas plants. The more states are involved, the broader the opportunities will be to buy and sell emissions credits in a way that keeps power prices down, said Dave Robertson, government affairs director at Portland General Electric. PGE is lobbying for national legislation, he said. Many leading utility companies are now doing the same. By driving up the price of fossil-fuel based power plants, the strategy could shift more efforts toward the development of renewable energy from the sun, wind and waves. "It is also a huge economic development opportunity, particularly for those states who are most aggressive in leading the charge toward a clean energy future," Kulongoski said. Ocean Power Technologies, Inc (OPT) and Pacific Northwest Generating Cooperative (PNGC Power) have signed an agreement to work cooperatively on the development of the Reedsport OPT Wave Park in Douglas County, Oregon [see previous post]. OPT expects to install its ocean-tested PowerBuoy systems -- initially generating a total of 2 megawatts (MW) -- approximately 2.5 miles off the coast at a depth of 50 meters. OPT has been issued a preliminary permit by the Federal Energy Regulatory Commission (FERC) for up to 50 MW of capacity at the site, and plans to develop, own and operate the initial 2 MW wave power park. In addition to supporting OPT in the permitting process and power transmission for the project, PNGC Power will work cooperatively with OPT to pursue a power purchase agreement (PPA), under which PNGC Power would purchase the electrical energy output of the 2 MW wave power park from OPT. PNGC Power plans to provide a significant portion of the funds required to fabricate and install the first PowerBuoy at the Reedsport site. Further, PNGC Power will provide its expertise regarding grid interconnection and its experience in meeting the standards of the Bonneville Power Administration, which operates much of the region's power system. "We are pleased that PNGC Power has pledged their support for this project and to be working cooperatively with them. PNGC Power has demonstrated the vision and leadership to harness our Earth's most powerful and consistent natural resource -- the ocean." Colorado Governor Bill Ritter (D) joined clean energy advocates to announce a new report showing that if the state doubled its renewable energy by 20%, it would add $1.9 billion to the gross domestic production in the state. The economic boon would come from increased manufacturing, installation, and operation of renewable electricity production, according to the report, which is entitled “Energy for Colorado’s Economy.” Produced by Environment Colorado, the report compares economic and environmental benefits of three alternative polices on electricity production, including “business-as-usual” with fossil fuel production, Amendment 37 which set a 10% renewable energy standard, and the 20% goal currently being considered by the Colorado state legislature. The Environment Colorado report found job creation was 4.3 times higher, wages paid was 2.2 times higher, and an increase in gross domestic product was 1.9 times higher for a 20% renewable energy standard than under Amendment 37. The report shows that a 20% renewable energy goal would also result in significant reductions of soot, smog, and mercury pollution. Also, since wind and most solar resources use a negligible amount of water compared to fossil fuel sources, Colorado could save over 18 billion gallons of water by 2020, according to the report. The report is available at www.environmentcolorado.org. In 2004, Colordao became the first state in the country to enact a Renewable Energy Standard by popular referendum. Amendment 37 requires Colorado's larger utilities to get 10% of their energy from clean, homegrown, renewable energy sources by 2015. It now appears that Xcel Energy, Colorado's largest utility, is on track to blow through the 10% target several years ahead of schedule, and the Colorado State Legislature is considering expanding the RES to 20% by 2020. Culminating two weeks of rapidly unfolding events, Minnesota Governor Tim Pawlenty (R, picuted left), on February 22 signed into law a renewable energy requirement for 25% of the electricity produced by the state’s utilities to come from renewables by 2025. Earlier in the week, the state House of Representatives passed the bill in a decisive 123-10 vote that had strong bipartisan support. The legislation also received overwhelming support in the state Senate, passing by a 61-4 margin earlier this month (see Wind Energy Weekly #1227). Depending on load growth and assuming that the entire “Renewable Electricity Standard” (RES) is reached through the deployment of wind power, it is expected that the state will need between 5,500 MW and 6,300 MW in new wind projects. The law specifies incremental benchmarks for utilities, with Xcel Energy’s RES ultimately reaching as high as 30%: 15% by 2010, 18% by 2012, 25% by 2016, and 30% by 2020. All other utilities, meanwhile, have a requirement of 7% by 2010, 12% by 2012, 17% by 2016, 20% by 2020, and 25% by 2025. Xcel Energy, one of the entities that worked with the bill’s authors during its development, said that overall, the RES is a good piece of legislation. “We think it strikes a good balance between pursuing an aggressive wind standard and protecting our ratepayers,” Rick Evans, the director of government affairs for Xcel Energy in Minnesota, told Wind Energy Weekly. Explaining how stakeholders had “a lot of discussions [with state officials] about “what could go wrong,” Evans said his company specifically liked the fact that any challenges in meeting the RES were to be taken to the Minnesota Public Utilities Commission (PUC), which he called “the right place to go” to address such issues. The legislation allows for the possibility of the targets to be delayed, but only if the PUC determines that it would be in the public interest to do so; further, the bill includes language to ensure that various roadblocks would not indefinitely delay or prove fatal to implementation of the RES for any utility. For example, transmission constraints and delivery issues would be one legitimate reason for utilities not hitting RES targets; however, in that event, utilities would be required to move forward in the regulatory and construction process for the needed new transmission. I guess adding the flexibility of being able to ask the Public Utility Commission to delay targets if they become too challenging to meet secured Xcel Energy's support for the Renewable Energy Standard. I'm a bit concerned about the level of flexibility this adds to the standard (policies have to have some teeth to them to ensure compliance), but having the state's largest utility on board throughout the process must have been instrumental in securing the kind of overwhelming support recieved by the MN RES. This policy practically flew through both the House and the Senate! MN now jumps to the front of the pack of clean energy states, with perhaps the most aggressive ramp up rate for new renewables of any Renewable Energy Standard policy. With any luck, Oregon will be snapping at their heals by the end of the year, although passing our RES is shaping up to be a bit more of a fight than the MN RES. Oregon's Governor Kulongoski has proposed a 25% by 2025 Renewable Energy Standard which will be right behind Minnesota's new policy in terms of the rate at which it requires Oregon's utility's to add new renewable energy sources to their mix. The Minnesota Legislature adopted the strongest renewable-energy standards in the nation Monday night when the House overwhelmingly approved the legislation. The bill, which passed 123-10, mandates more production of such things as wind, hydrogen and solar power and sets in motion a timetable to increase the state's use of renewable energy for the next 18 years. Identical legislation already has passed the Senate. The bill, which went through a delicate political navigation that included the utilities, environmental groups and business, now heads to Gov. Tim Pawlenty, who has pledged to sign it. As of 2006, 23 states have established similar targets, but the Minnesota legislation would leapfrog the state to the front of renewable-energy generation nationwide. Besides hoped-for environmental benefits, backers hail the measure as a way of producing home-grown energy, rather than being forced to rely on the vagaries of foreign fossil fuels. Production and operation of such things as wind turbines could bring jobs to rural areas of the state long in need of steady work. "Right now, Minnesota imports more electricity than any other state. We need to keep more of our money at home," said the bill's sponsor, Rep. Aaron Peterson, DFL-Appleton. It has been estimated that, when implemented, the use of renewable energy under the bill will save consumers and businesses as much as $500 million a year. The measure requires the state's energy companies, except Xcel Energy, to provide 25 percent of their power through renewable sources by 2025. Xcel, which represents about half the state's electricity, would generate 30 percent renewable energy by 2020. The proposal would require adding about 5,000 megawatts of renewable generating capacity to Minnesota's electricity grid, about eight times more than the state currently generates from renewable sources. Most of the additional renewable energy probably would come from an estimated 3,000 new giant wind turbines that would dot farm country, but it could also come from other sources such as biomass. During the House debate, critics registered concerns about the potential costs of implementing the mandates, suggesting that ratepayers might be forced to bear an undue burden for implementation. One amendment, from Paul Kohls, R-Victoria, would have allowed an exemption from the mandates if those rules would cause rates to increase by 10 percent or more. "We all support renewable energy, absolutely," Kohls said. "But let's make sure we're doing it in a way that our constituents -- yours and mine -- can afford." "We don't want politicians setting the rates," said one opponent of the amendment, Rep. Dennis Ozment, R-Rosemount. Another amendment sought to allow the state to consider construction of new nuclear power plants. Minnesota is the only state that prohibits such construction. "If we are to achieve energy independence in the U.S., all states need to keep nuclear energy as an option," said the amendment's author, Rep. Joyce Peppin, R-Rogers. It also failed. Three states -- California, Texas and Iowa -- produce more wind-generated electricity than Minnesota, which added 145 megawatts of wind power in 2006, enough to light 43,500 homes. Xcel, the nation's leading utility in using wind power, purchased about 1,000 megawatts of turbine-generated electricity last year and hopes to increase that to 2,300 megawatts this year. The utility recently announced plans to build a $210 million wind farm in Minnesota that will generate 100 megawatts of electricity by 2009. The bill gives the state's Public Utilities Commission some leeway in determining whether to delay or modify implementation of the rules. The commission can consider such things as the potential impact on customer fees, issues of reliability, siting delays and transmission restraints. The bill also allows utilities that exceed their required amounts of renewable energy to sell credits to other utilities. I don't know what it is about Minnesota's political situation, but I am very impressed by how quickly this Renewable Energy Standard flew through the state legislature and the degree of support it recieved. The companion bill passed the Senate with a 64-1 vote after only a couple of days of debate and made it out of both committees with a unanimous vote in the Senate and only one nay in the House, if I'm not mistaken. Those are the kind of results I can only dream about as I work on passing Oregon's proposed 25% by 2025 Renewable Energy Standard. We're looking at a much longer fight in the legislature, and although I am optimistic it will pass eventually, it will probably not be by anything like the kind of margin of victory for Minnesota's RES. I'm not sure exactly how the math works out, but Minnesota is now claiming the most aggressive RES in the nation. With Xcel making up about half of the state's load and having to meet the more aggressive target and deadlines (30% by 2020 instead of 25% by 2025 for the rest of the state's utilities), I would imagine that that claim is justified. A consortia backed by Airtricity has committed to the construction of a 345-kilovolt (kV) transmission 'loop' in the Texas Panhandle Plains region: The $1.5 billion 'Panhandle Loop' will be a 800-mile 'looped' transmission project bringing 4,200 megawatt (MW) of wind energy to more than one million homes. The proposal for the three interconnected transmission lines extending from three separate loops on the grid has been filed with the Public Utility Commission of Texas (PUCT) and, once approved, all parties are committed to moving it forward with a goal of project completion as early as late 2010. The consortia behind the Panhandle Loop include Airtricity, Inc.; Babcock & Brown Renewable Holdings Inc; Celanese, Ltd.; Occidental Energy Ventures Corp.; and Sharyland Utilities, L.P.
"The Panhandle Loop project is like constructing a power station greater than the entire generation for Ireland and building it by 2010," said Airtricity's Chief Executive, Eddie O'Connor. Airtricity, an integrated utility that generates and supplies green electricity, currently supplies renewable electricity to more than 35,000 commercial customers in the Republic of Ireland and Northern Ireland. It is actively developing wind farms onshore and offshore throughout Europe (Ireland, United Kingdom, Germany, the Netherlands), the U.S. and Canada, and has wind farms operating across Ireland and in Scotland at Ardrossan. I don't know where they are getting their capital, but Airtricity has big visions and big plans, and if this project is any indication, it looks like they might actually be able to pull it off. More power to them! They don't require the damming of free-flowing rivers. They don't emit greenhouse gases that contribute to global warming. They don't produce nuclear waste, create the potential for a disastrous accident or pose a terrorist threat. Geothermal power plants, by tapping the underground heat of the Earth and converting it to electricity, provide one of the cleanest, safest sources of renewable energy. And Utah is a prime location for geothermal energy development. We're sitting on a gold mine, folks, a gold mine of hot water, steam, magma and super-heated bedrock. Some day, if we're willing to make the investment in research and development to allow it to be tapped in a profitable manner, geothermal energy could contribute mightily to our nation's energy supply. And while the Bush administration acknowledged that fact by extending production tax credits for geothermal power plants through 2008, it is attempting to eliminate geothermal research funding for the second year in a row. The budget cut equates to $25 million, just a drop in the $2.9 trillion budget bucket for fiscal 2008. Last year, Congress had the sense to restore the funding, and we're hoping for a repeat performance. Advertisement should be able to take it from here. Yet geothermal power plants provide just a fraction, less than 1 percent, of the nation's electricity. That doesn't sound like a mature industry to us. Plants, wells and pipelines are expensive to build. It can cost $110 million for a 50-megawatt plant to serve 50,000 people. And they're expensive to operate. Corrosive water can foul turbines, reservoirs must be managed, sludge must be disposed of. More research is needed to make the process profitable, and the DOE's Geothermal Technologies Program has a lot of toes in the water. Federal researchers have been working hard to help solve the industry's problems, from plant operations to site exploration. Karl Galwell, executive director of the Geothermal Energy Association, said the research dollars will pay dividends. We agree. Researchers are sure to hit some gushers. If Congress fails to restore the research funding, we should all be steamed. Geothermal power plants provide one of the cleanest, safest sources of renewable energy on Earth. 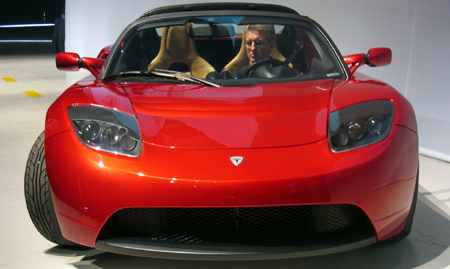 Tesla Motors [makers of the Tesla Roadster all-electric sports car (pictured left)] will build its new automobile assembly facility in Albuquerque, New Mexico. Construction on the 150,000 square foot plant will begin in April 2007, at the latest. The New Mexico plant will be the company’s first assembly facility in the United States, and will produce the WhiteStar, an upcoming four-door, five-passenger all-electric sports sedan. New Mexico Governor Bill Richardson has directed the state’s General Services Division, and other appropriate agencies, to investigate the purchase of 100 WhiteStar vehicles for the state fleet over a two year period as a demonstration of the state’s commitment to clean energy. Governor Richardson has also invited Tesla Motors Chairman Elon Musk and Tesla Motors CEO Martin Eberhard to work with the state to develop a package of legislation for the 2008 session to encourage and incentivize the purchase of clean energy vehicles, including hybrid and electric vehicles. 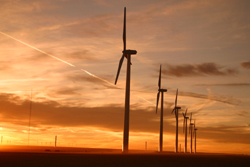 "This is a major step toward making New Mexico a center for 'green' manufacturing. In my role as chairman of the Senate Energy and Natural Resources Committee, I will continue crafting policies at the federal level to ensure that the electric cars like those made by Tesla&madsh;and other companies specializing in cutting-edge renewable energy technologies—will eventually be commonplace. I commend Gov. Richardson, Secretary Homans, Gary Tonjes, Clark Krause and Mayor Chavez for working hard to recruit Tesla to our state." Several states, including Arizona and California, were in talks with Tesla Motors over locating the WhiteStar assembly plant. The first cars will roll off the assembly line in the fall of 2009, and Tesla Motors will produce at least 10,000 cars each year. The vehicles will cost $50,000 for the standard model or $65,000 for a premium model with greater performance and range. Tesla Motors begins production of its first vehicle, a zero-emission two seat Roadster, at a facility in England owned by Lotus Cars later this year. Tesla Corporate Headquarters will continue to be located in San Carlos, California. Tesla recently announced the opening of an R&D facility in Rochester Hills, Mich., north of Detroit, where it expects to grow to a staff of 60 focused on design and engineering for the WhiteStar. Tesla Motors will receive several incentives from the state, including the high wage job tax credit, the manufacturer’s investment tax credit and assistance from the Job Training Incentive Program. In addition, Governor Richardson has committed $3.5 million in capital outlay from the 2007 legislative session, and another $3.5 million in capital outlay from the 2008 legislative session. These funds will go to Bernalillo County and be used for building and infrastructure investment related to the facility. The state’s Economic Development Department worked closely with the Albuquerque Economic Development Department and the New Mexico Economic Development Partnership to close the deal with Tesla Motors. The city of Albuquerque and Bernalillo County have agreed to assist with development of infrastructure to the site. First Community Bank has agreed to participate as a local lender. SunCal, which recently acquired approximately 57,000 acres on Albuquerque’s west side, pledged at no cost up to 75 acres of land abutting the initial site if the company undertakes a major expansion in the future. Who says the electric car is dead?! While Detroit delays on releasing even a plug-in hybrid, citing insufficient battery technology, start-ups like Tesla Motors, Pheonix Motorcars and ZAP march towards the commercial release of electric-vehicles. While pricey, this new generation of EVs will hopefully prove that the electric vehicle, and it's cousin the plug-in hybrid are the viable, clean, and efficient future for transportation. The governors of both Illinois and New Jersey called for statewide greenhouse gas reduction targets yesterday. New Jersey Governor Jon Corzine and Illinois Governor Rod Blagojevich both issued new goals aimed at reducing emissions of greenhouse gases within their states back to 1990 levels by 2020. "Today we have taken steps to preserve our planet for our children and grandchildren by adopting aggressive goals for the reduction of greenhouse gas emissions," Governor Corzine said. "In the absence of leadership on the federal level the burden has now fallen upon state executives and legislatures to lead the way on this issue and I’m proud that New Jersey is helping to blaze that trail." To reach the governor's goal, the Commissioner of the New Jersey Department of Environmental Protection (DEP) will work with the Board of Public Utilities (BPU), the Department of Transportation (DOT), the Department of Community Affairs (DCA) and other stakeholders to evaluate methods to meet and exceed the 2020 target reductions, according to a press release. The DEP Commissioner will make specific recommendations to meet the targets while taking into account the economic benefits and costs of implementing these recommendations. This evaluation will be done in conjunction with the state’s Energy Master Plan, which will incorporate the new greenhouse gas reduction goal. The order calls on the DEP to develop a 1990 greenhouse gas emission inventory as well as a system for monitoring current greenhouse gas levels so that progress toward goals can be accurately tracked. DEP will report progress towards the target reductions no less than every two years and if necessary will recommend additional actions to reach the targets. To further reduce emissions, the order calls for the Director of Energy Savings to develop targets and implementation strategies for reducing energy use by state facilities and vehicles fleets. The administration will call on other states to join in its efforts and will work closely with the Legislature to pass legislation to support and strengthen the targets set out in the Executive Order. Senator Barbara Buono (D-Middlesex) and Assemblywoman Linda Stender (D-Union) are currently working on a bill to accomplish that goal. As a member of the Regional Greenhouse Gas Initiative, a cooperative effort of Northeastern and Mid-Atlantic states working to reduce carbon dioxide emissions, the Corzine Administration will set up a cap and trade program to help limit carbon dioxide pollution from electric power plants. Under this system power plants that exceed a predetermined level of carbon dioxide emissions will be required to pay a fee for each ton of carbon emitted over the limit. Governor Corzine will work with the Legislature to dedicate up to 100% of these funds to promote energy efficiency, renewable energy as well as other projects that benefit electric users. Senator Bob Smith (D-Middlesex) and Assemblyman John F. McKeon (D-Essex) are currently working on legislation to accomplish this goal. In Illinois, similar efforts are underway to implement Governor Blagojevich's goal. “The impact of global warming in Illinois and around the globe could be devastating, and we can’t wait for the federal government to act because scientists worldwide have warned that we must address climate change within the next decade to avoid serious and irreversible consequences,” said Gov. Blagojevich. “The international community recognizes that rising temperatures, melting glaciers, and unusual weather patterns are warning signs telling us that climate change is a reality. Now, despite inaction by President Bush, we must deal with it. By committing ourselves to action in Illinois, we can help minimize the effects of climate change and ensure our children and grandchildren inherit a healthy world full of opportunity." According to a press release, the Illinois governor has charged his Climate Change Advisory Group with recommending strategies to meet these GHG reduction goals. The advisory group will meet over a six-month period to identify measures to cost-effectively reduce greenhouse gases. The Illinois Climate Change Advisory Group will be chaired by Doug Scott, Director of the Illinois Environmental Protection Agency. Vice Chairs include Michael Carrigan, Secretary/Treasurer, Illinois AFL-CIO; Art Gibson, Senior Vice President, Baxter Healthcare; and Howard Learner, Executive Director, Environmental Law and Policy Center of the Midwest. The World Resources Institute will facilitate the Advisory Group meetings and provide technical assistance. Other members of the Advisory Group include: ADM, Ameren, BP America Inc., Caterpillar, Inc., Center for Energy and Economic Development, Citizen Action of Illinois, Citizens Utility Board, City of Chicago, Deere & Company, Dynegy, Environment Illinois, Faith in Place, Ford Motor Company, League of Women Voters of Illinois, Midwest Generation, Midwest Wind Energy, NICOR, Natural Resources Defense Council, Phoenix Architects, Inc., Regional Transportation Authority, Scates Farm, Sieben Energy Associates, Sierra Club - Illinois Chapter, State Farm Insurance, United Transportation Union, University of Illinois – Chicago, University of Illinois - Urbana/Champaign, Village of Schaumburg, and Waste Management, Inc. In 2006, the California Assembly passed, and the Governor signed into law, the California Global Warming Solutions Act of 2006 which is also intended to bring statewide emissions of greenhouse gases back down to 1990 levels by 2020—an estimated cut of 25%. The new solar energy company claims it will soon open the world's largest solar photovolataic manufacturing plant - a 500 MW facility located in the Northeastern United States - will launch the world's largest vertically-integrated solar manufacturing, marketing and installation company and begin to install 100,000 solar PV systems in the United States annually (that number incidentally being larger than the total number of installations completed in the United State to date and about the same as the number of installations that Germany's highly-tuned, efficient solar infrastructure installed in 2006). Oh, and they're going to do all this while offering residential solar systems for just $20,000, or about half the current market rate, enough to provide you with clean, solar power at the same rate you are currently paying for electricity, the company claims. Citizenre is taking sign-ups now, and a lot of folks are getting caught up in the big promises. After all, who wouldn't want to generate their own solar power instead of paying their utility without paying any more than they do right now?! Well, you know what they say about things that seem too good to be true, and Citizenre's hyped-up promises surely fit the bill. RenewableEnergyAccess.com just posted a RenewableEnergyInsider opinion piece by Jeff Wolfe, CEO and co-founder of groSolar, one the nation's largest solar energy distribution and installation firms. He's been following the Citizenre debate, has interviewed their Chief Technical Officer, and makes some very good points about the company's claims. While he's certainly part of the 'establishment industry' that would presumably be threatened if Citizenre's can deliver on their claims, his points are valid: to be as punny as possible, Citizenre is promising us the sun, and they haven't given us any indication that they can make good. Citizenre: A House of Cards? There has been a buzz in the air lately. It's the sound of U.S.-based Citizenre, a new multi-level marketing machine targeting solar power. Their plan? Build "the world's largest" solar cell and module manufacturing plant with the stated intention to install 100,000 residential systems annually. Their pitch? You can have solar electric power for the same price that you currently pay for electricity. Sign up now and they will do the installation in September as long as your state offers net metering. Does this mean that solar electricity has finally hit the mainstream? Is solar now affordable for all and at a scale that will make a difference in the U.S. and worldwide? Not so fast. After several weeks of reviewing this new company's claims, discussing the manufacturing build out plan and its network marketing approach with others in the solar energy industry, plus reading online commentaries from a variety of sources and actually talking with representatives of the company, I have pieced together enough information to express my opinion that Citizenre is not going to be able to stand up to their promises. There has been no financial announcement for a deal of significant proportion, which would be the enabling factor to meet the product or installation capacity required. This company is building is a "house of cards" and attracting a lot of customers who want a deal that's too good to be true. So, you ask, what's the problem if Citizenre is not real or if they fail, and the public just gives early buyers a told-you-so, buyer beware shrug of the shoulders? The answer is we all lose. As soon as someone signs up for a Citizenre solar system, they are removed from the pool of potential customers for other reputable solar dealers in the U.S. Already, photovoltaic (PV) dealers are telling me that they are losing business because potential customers are signing up with Citizenre -- people are waiting until the reported 500 megawatt "largest fully-integrated PV manufacturing plant in the world" comes online this fall. A lot of very disappointed and upset people. A lot of traditional PV dealers who are out of business. Reduced or eliminated federal and state incentives for solar electricity due to a perceived lack of need. A solar electric industry in the U.S. that has been set backwards 5 years. What follows is an exploration of Citizenre's claims based upon extensive communication from others in the industry, Internet postings and a telephone conversation with Rob Wills, Citizenre's Chief Technical Officer. Wills volunteered to join an industry list serve (RE-Markets@Topica.com) and answer questions regarding the company. From all sources, I have consolidated the results in each "Summary Opinion" below. Questions & Issues: Citizenre is indicating publicly that they have raised $650 million, and are constructing the world's largest PV manufacturing facility (PR Web, January 23, 2007, "Is the Sun Finally Rising on Solar Power? An Interview with Rob Styler, President of Powur of Citizenre. This would be the single largest investment in solar power ever, yet we've heard not one detail -- not who, when, or where..
Summary Opinion: What I found is that construction has not even started on the proposed manufacturing facility -- again the largest in the world. A ground breaking date is not set, nor a location. They will not break ground until they have closed on their major financing. They have not closed on their financing although they indicate it is lined up and they simply need to clear a few hurdles. Citizenre stated that they could have a plant on line in 12 months. In my opinion, that puts their available manufactured product supply out by at least 18 months. Questions & Issues: The PV manufacturers worldwide are experiencing a shortage of polysilicon. Industrial-strength PV giants have been forced to their knees, and signed up in advance for long term multi-million dollar contracts for silicon. New-comer Citizenre apparently plans on making silicon appear on command, at pricing they dictate. There has been no announced contract like every other major silicon deal. Like "where's the beef", I ask "where's the silicon"? Summary Opinion: Rob Wills indicated that Citizenre has a source for silicon at "significantly below $60/kg". My opinion is that when an established international PV companies like SCHOTT Solar cannot obtain sufficient silicon, there is no way for an unproven startup to obtain silicon, and certainly not at below market prices. Without public details, there is no way to justify this position. Questions & Issues: Citizenre claims they will install 100,000 systems. At $20,000 each (about half the cost of an average system today) that's $2 billion of installations per year. That's equivalent to 450 installations every business day -- a great goal. But 100,000 installations is more than the total number of installations completed in the U.S. to date. From zero to 100,000 is not an easy ramp up. Before millions of dollars in customer contracts are sold, we should know much more about the company's plan and its team to manage this steep trajectory of growth and speed. Summary Opinion: It turns out that the entire marketing effort to-date has been a "pilot program", according to Wills. He says they are now thinking 25,000 systems, yet the many Citizenre web sites and their representative "downline distributors" are still telling others 100,000. The marketing in the public domain is going to be revamped to "correct some issues" according to Mr. Wills, yet the question remains as to who is in control of the messaging to vulnerable consumers. Questions & Issues: Citizenre states it will be able to reduce material costs sharply because they have "vertical integration" and will "be able to produce the final product at half the cost of our competitors", according to Rob Styler in the interview quoted above. Unfortunately, the price of solar power is not purely a function of volume production. Glass, aluminum extrusions, Tedlar (R) and lead wires are all commodity products, but all comprise a significant piece of the cost that Citizenre can not affect. To think that a startup is going to beat world leaders like Sharp, Kyocera and Suntech (that are currently producing at scale) is naive. What technology is Citizenre planning on using? With more knowledge, we can then understand the probable costs of the technology for comparison purposes. Summary Opinion: I received no answer to the questions and issues above. Questions & Issues: Rob Styler, in the above cited interview, states that installation will take "about half a day". I've done installation work. I don't care what kind of fancy technology the modules have, they still need to get fastened down to a roof, and 200 to 500 square feet of panels are needed. Then a wire needs to be run to the electric panel, through an outside disconnect. On most jobs, after half a day the ladders are set up, and the conduit to the ground is run. Installations taking a day (in areas with one story homes and low slope roofs) are possible. Does Citizenre have some secret to speeding up installations beyond their AC PV module currently in design as stated? Have any installations been done by Citizenre that have approached this time schedule? Summary Opinion: Mr. Wills said he believes Citizenre can get to this reduced installation time. He speaks of automation and standardization to achieve this, but has presented nothing concrete on how to achieve this goal. So, Citizenre has no secret to lowering the cost of installation, they just believe they are smarter than the entire rest of the industry that has been installing on-grid non-battery systems. Even in Germany, which is so often touted as a model of efficient and quick installation, systems installs do not approach the half day goal. Questions & Issues: In one of the emails, Mr.Wills asked: "Is it better to try for a quantum leap that results in PV power costing less than retail electricity? Or should we sit back doing business as usual, letting the government tell us they are supporting solar. Please give us a chance to move this ahead and to succeed. There is plenty or work for all of us. Solar Energy is abundant." PV panels. The manufacturing facility will be operational in 18 months at the earliest in my opinion. Inverters. Inverters have proven to be very difficult to create. Most new inverter companies fail before they succeed, and many established companies have new products fail before being fixed. The real world of PV is a harsh environment, with difficult input parameters. No beta tests mean that you cannot know when or how the inverter will function, or even if it can be produced at your super low vertically integrated required cost. And that says nothing about the arduous UL certification process. Integrity. Say what is true, and deliver what you say. Citizenre cannot feasibly deliver what it has promised to date. Citizenre knew that the September installations could not happen at least as of January (with no plant under construction...) but has yet to make a public acknowledgment. Realistic Plan. A complete integrated business plan that has sales coordinated with production and supply. In its current incarnation, it is my opinion that Citizenre represents a significant threat to the solar industry. Exaggerated claims, inability to deliver product, sales to areas where they do not intend to install soon. These issues can taint the entire solar industry. Worse, misled customers will delay or not buy products from reputable dealers, putting these sound businesses at risk. This is not the reaction from people who are scared of change. This is the response from committed individuals and businesses who want the solar industry to succeed. To see Citizenre endanger that vision by over-promising and under-delivering reminds me of a teetering house of cards. Jeffery Wolfe is the CEO of groSolar, a national solar integration firm focused on designing, distributing and installing high quality energy systems. Jeff is a recognized leader in the solar industry and has led the design and installation of some of the largest solar projects in the U.S. He serves on the board of the Solar Electric Industry Association (SEIA) and chairs the PV division. While a partner at the engineering firm Bard, Rao & Athanas, he designed over four million sq. feet of construction and nine MW of power generation. He is a certified professional engineer and has a BSME degree from Cornell University. Stay tuned for a special report on Citizenre in this Thursday's episode of Inside Renewable Energy [which I will cover], featuring an interview with company CEO David Gregg. Detroit is going on a green offensive with electric plug-in models that can run emissions-free for up to 40 miles -- at about a quarter the cost of gas -- on batteries that draw their juice directly from the grid. GM's Chevrolet Volt and Ford's HySeries Drive, unveiled as concept prototypes for the first time last month, leapfrog current hybrid designs and could put pressure on Toyota's popular Prius by offering consumers better value [see Green Car Congress write ups here (GM) and here (Ford) for more details on the cars and drivetrains]. Although these cars are not scheduled for production until the end of the decade or later, many experts now believe plug-ins offer the best tradeoffs combination yet in terms of energy efficiency, emissions and practicality. "Once plug-in hybrids appear, I don't know why 'mere' hybrids would be appealing," said Philip Reed, the Fuel Economy Guide editor for Edmunds. "Plug-in hybrids do everything that hybrids can do but at a lower cost to consumers." In 2007, GM will introduce its first two hybrid sedans, the Saturn Aura Green Line and Chevrolet Malibu, eight years after the first hybrid sedans were sold in the United States. GM is aggressively pursuing plug-in hybrids "because of the tremendous potential to significantly increase fuel economy," according to spokesman Brian Corbett. He said GM is developing plug-in hybrids now so "when the advanced batteries are ready for production, our plug-in vehicles should be ready, too -- which means we'll be ahead of the curve." Interest in plug-in hybrids could also be limited to people with garages or other ready access to charge their vehicles through electric outlets. Consumers recharge the vehicle's batteries -- preferably during off-peak hours -- by plugging the vehicle into a standard 110-volt outlet. After the batteries are depleted, another energy source such as petroleum, alternative fuel or a hydrogen fuel cell takes over propulsion. Plug-in hybrids "may not be for you if you live in an apartment or condo," said Sherry Boschert, the author of Plug-In Hybrids: The Cars that Will Recharge America. Outlets must be added to parking garages to provide public charging stations, and a metering system to charge vehicle owners would have to be developed by power companies, according to Boschert. Power companies in states like California, where demand occasionally outstrips grid capacity, would have to find ways to discourage or prevent cars from being recharged during peak demand periods. Until the infrastructure is created "it is going to be a bumpy ride" for plug-in hybrids, Boschert said. New legislation that would require many U.S. utilities to generate 20 percent of their electricity from renewable energy resources by 2020 was introduced yesterday by Congressman Tom Udall of New Mexico. House bill 969 proposes to "amend title VI of the Public Utility Regulatory Policies Act of 1978 to establish a Federal renewable energy portfolio standard for certain retail electric utilities and for other purposes." The bill defines a renewable energy resource as solar (including solar water heating), wind, ocean, tidal, geothermal energy, biomass, landfill gas or incremental hydropower. "A renewable portfolio standard should be passed this Congress," said Alan Nogee, Union of Concerned Scientist Clean Energy Program Director. "The bill gives the American people what they asked for in the election -- a smart, cost-effective strategy to reduce our dependence on fossil fuels and get America on a track toward energy independence. And because power plants are a primary source of heat-trapping emissions, this bill can be an important part of solving global warming." With Washington State's passage this fall of an RPS ballot initiative, 21 states and the District of Columbia now have renewable portfolio standards. Since 2004, eight states and the District of Columbia have enacted standards, according to the Union of Concerned Scientists. In August 2005, Texas more than doubled its standard, creating the second-largest new renewable energy market in the country, behind only California. Seven other states (Arizona, California, Minnesota, Nevada, New Mexico and New Jersey) have also increased or accelerated their standards. "The states have already shown us that renewable standards can be successful," said Nogee. "The federal government should step in with its own standard so the entire country can enjoy the benefits of renewable energy. The nation's security and the health of our planet are too important to leave to the states." A 2004 Union of Concerned Scientist analysis of a similar bill calculates the multiple benefits from a national portfolio standard: By 2020, a 20 percent RPS would create 355,000 jobs -- nearly twice as many as electricity from fossil fuels would generate; competition from renewable energy generators would lower electricity and natural gas prices, saving consumers more than $49 billion on their energy bills; and farmers, ranchers and rural landowners would earn more than $16 billion in new income. H.R. 969 is being co-sponsored by representatives Todd Platts (R-PA), Mark Udall (D-CO), Frank Pallone (D-NJ), Chris Shays (R-CT), Diana DeGette (D-CO), Lloyd Doggett (D-TX) and Jerry McNerney (D-CA). I need to look more into the details of this bill, but as long as this national Renewable Energy Standard does not preempt the 21 state-level RES policies already in place, this would be an excellent policy. As long as states have the freedom to set higher standards than the federal standard, enacting a national RES will be great step towards a clean energy future. RES policies ensure we utilize our clean, homegrown renewable energy resources, drives economic development (particularly in rural America), helps stabilize rising energy rates, reins in global warming pollution and creates a cleaner, healthier energy supply - all great reasons to support Renewable Energy Standard policies! If you are interested in telling your representatives to support this bill, head to the Union of Concerned Scientists' website here. By a 61-4 margin, Minnesota’s state Senate passed a renewable energy requirement for 25% of the electricity produced by utilities to come from renewables by 2025. With the bill having cleared the Senate, the House’s Energy Finance and Policy Division Committee is scheduled to debate similar legislation next week. The “Renewable Energy Standard” (RES), as it is called in the state, would result in 5,000-6,000 MW in renewable energy being developed. The legislation specifies incremental benchmarks for utilities, with Xcel Energy’s RES ultimately reaching as high as 30%: 15% by 2010, 18% by 2012, 25% by 2016, and 30% by 2020. All other utilities, meanwhile, would have a requirement of 7% by 2010, 12% by 2012, 17% by 2016, 20% by 2020, and 25% by 2025. The legislation allows for the possibility of the targets to be delayed, but only if the Minnesota Public Utilities Commission determines that it would be in the public interest to do so; further, the bill includes language to ensure that various roadblocks would not indefinitely delay or prove fatal to implementation of the RES for any utility. For example, transmission constraints and delivery issues would be one legitimate reason for utilities not hitting RES targets; however, in that event, utilities would be required to move forward in the regulatory and construction process for the needed new transmission. I've been following the development of the Minnesota RES as it plays out in the Minnesota Senate and House over at the excellent blog, Energista.org. Check out the long series of updates on the Minnesota RES over at Energista for more and stay tuned over there for continued updates as the RES progresses through the Minnesota House. Changing course on an issue key to their members, the Edison Electric Institute (EEI) unanimously voted to approve a set of new climate change principles that back economy-wide national policies including price signals for carbon. The principles generally call for a national policy that would provide certainty within the business environment. EEI President Tom Kuhn said that any federal action or legislation needed to have three components: ensuring the development and cost-effective deployment of a full suite of “climate-friendly” technologies, minimizing economic disruption to customers and avoiding harm to the competitiveness of U.S. industry, and ensuring an economy-wide approach to carbon reductions. “No matter what path America chooses to address greenhouse gases, success will require an aggressive and sustained commitment by the industry and policymakers to the development and deployment of a full suite of technology options,” said Kuhn. Such options, EEI said, include renewable energy, demand-side management, energy efficiency, nuclear capacity, new coal technologies and carbon capture and storage, and plug-in hybrid electric vehicles. EEI’s principles generally call for strong action that does not bring major harm to the economy. The document references wind specifically, stating that federal policy should address regulatory or economic barriers to wind’s (and other energy sources’) further deployment. The principles support federal policy that “employs market mechanisms to secure cost-effective greenhouse gas reductions and provides a reasonable transition and an effective economic safety valve.” The principles also call for a long-term price for carbon “that is moderate” and does not harm the economic competitiveness of U.S. industry and fosters the development of zero-emission technologies. Another element of note is that companies’ previous action to limit greenhouse gas emissions should be recognized, the principles state. EEI’s release of its principles follows the announcement by the Electric Power Supply Association, a trade group of electricity suppliers representing about one-third of U.S. power generation, calling for “comprehensive, mandatory” federal greenhouse gas legislation. Meanwhile on Capitol Hill, House Speaker Nancy Pelosi (D-Calif.) pointed to the United Nation’s Intergovernmental Panel on Climate Change report’s statement that global greenhouse gas emissions must be cut in half by mid-century to avoid major environmental impacts. Speaking before the House Committee on Science and Technology, Pelosi echoed the report’s conclusion that prompt action is needed to avoid those impacts. “We cannot achieve the transformation we need, both in the United States and throughout the international community, without mandatory action to reduce greenhouse gas pollution,” she said. Pelosi said that she hoped to have global warming legislation clear the appropriate House committees by July 4. ZAP and Lotus Engineering are beginning the first phase of an engineering project to use the British consultancy’s APX ("Aluminum Performance Crossover" - pictured to right) as a basis for designing a production-ready electric all-wheel drive crossover high performance vehicle for ZAP—the ZAP-X—in the US market. A combination of the lightweight aluminum vehicle architecture, a new efficient drive and advanced battery management systems is intended to enable a range of up to 350 miles between charges, with a rapid 10-minute recharging time. An auxiliary power unit is planned to support longer distance journeys. The APX’s supercharged gasoline 3.0-liter V6 engine will be replaced by in-hub electric motors, delivering 644 horsepower in all-wheel drive mode, theoretically capable of powering the ZAP-X to a potential top speed of 155 mph. A new strong, lightweight and highly efficient structure based on the Lotus technology is planned to give the car a very attractive power-to-weight ratio. 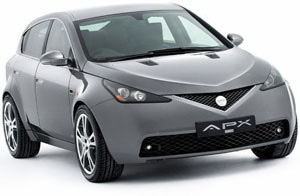 The APX showcases Lotus Engineering’s Versatile Vehicle Architecture technology, combining lightweight aluminum vehicle architecture with exceptionally strong and stiff structural rigidity, as well as lower manufacturing investment requirements. According to Lotus, the key to the VVA architecture is the high-pressure die cast corner nodes that are combined with bonding, mechanical fasteners, extruded and pressed aluminium. Having first been shown to the world at the Geneva motor show in 2006, the APX concept has won the 2006 European Aluminium Awards in the “Transport and Automotive” category. 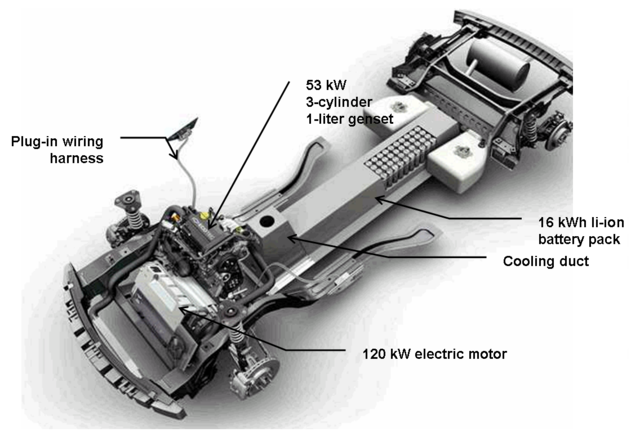 The use of in-wheel motors leaves the space previously occupied by the conventional engine and drive train for additional battery capacity and amenities. The development program is proposed to be managed from a new center of excellence for research and development of environmentally-friendly vehicle designs and technologies. Engineering input will come from Lotus Engineering Inc, and the British technology consultancy’s other R&D centers in the UK, Malaysia and China. "Lotus Engineering’s APX is a world-class innovative concept and was developed to showcase real solutions to new challenges facing the automotive industry. So it’s very satisfying that ZAP’s proposed new model will make use of a great deal of the APX concept’s advanced body structure and chassis technology. The bringing together of these next-generation vehicle technologies represents another significant step forward for automotive technology." Earlier in January, ZAP had announced the selection of Lotus Engineering to undertake engineering concept studies for a number of electric vehicles. ZAP will display the current Lotus APX concept car at the North American Dealers Association (NADA) annual meeting and exhibition, 3-6 February 2007. According to another great post on the ZAP-X over at The Energy Blog, ZAP is targeting a price point of about $60,000 and plan to have the high-performance EV available as early as 2008. Given this timing and price point, the ZAP-X will likely compete with the second-generation electric sports-sedan planned by Tesla Motors, makers of the Tesla Roadster EV [see previous post]. Tesla is targeting a 2009 timeframe for it's sports sedan, which will be comperably priced between $50,000-$70,000 price range. The higher end Tesla Roadster sells for $92,000. Tesla plans to sell between 10,000 and 20,000 units per year of it's sports sedan model. Presumably, ZAP could produce a 'tuned-down' model with a bit less 'get-up-and-go' and shave a bit off that price tag if they wanted to. Cutting back the power would mean a smaller and cheaper battery pack as well as electric motor. It will be interesting to see if this higher-end, high-performance market segment can help drive forward the commercialization of electric vehicles (and plug-ins - the batteries for EVs are very similar as the ones used in PHEVs with all-electric ranges, just larger). I'm surprised that one of the big auto manufacturers hasn't decided that producing a high-end, high-performance EV, like these offerings from Tesla and ZAP, in order to help green their image a bit (with a production model EV) and build up the production lines, supply chains and technical expertise needed to get the cost down and produce a more average consumer-oriented EV or PHEV. Regardless, these Tesla, ZAP and Pheonix EVs continue to make me question all the fuss GM is making over Lithium ion battery technology not being ready for prime time yet. Either Tesla and ZAP are overly optimistic, or GM is dragging it's heels. Given GM's track record, I bet it's more likely the latter. As many of you may remember, I wrote a fairly extenensive summary of all the 'green' car offerings at the 2006 North American International Auto Show, held in Detroit each year. This year, I was too caught up in other things to write up a proper review of this year's offerings (I did begin a post on the plug-in hybrid offerings from GM and Ford but haven't gotten around to finishing it yet...). The North American International Auto Show (NAIAS) in Detroit marks the beginning of the global auto show season, and often serves as a positioning venue where automakers introduce concepts as well as production models of new cars. Crossover vehicles were a common thread throughout the show. However, hybrids were more in evidence, although not in the form of a new production car. Tier 2 Bin 5 compliant diesel announcements began to pile up, and several automakers introduced more gasoline direct injection versions. Herewith, a quick recap of the “greener” announcements from the major automakers. General Motors set a high bar for the show with its opening announcement of the Volt plug-in series hybrid concept and the E-Flex architecture. The Volt offers an all-electric range of 40 miles before requiring a recharge. Drive less than that, and your fuel consumption is zero. At maximum range (640 miles), the fuel consumption of the genset is approximately 50 mpg. GM also introduced the 2008 Malibu, and confirmed that the hybrid version of the Malibu will arrive later this year with the start of production. The automaker also highlighted the already introduced Saturn VUE (SUV) and Aura (sedan) Green Line hybrids. All three of those vehicles use the same GM Hybrid System, a Belt Alternator Starter system with a Cobasys NiMH battery pack. The Aura Green Line sedan will deliver at least a 25% fuel economy improvement over the non-hybrid Aura XE for a premium of less than $2,500, according to GM [from about 20 mpg city/30 highway to ~25 city/38 highway]. GM did not announce specs for the Malibu hybrid. Also on display on the GM stand was the Saab BioPower Hybrid Concept, making its US debut. The vehicle combines fossil fuel-free bio-ethanol fuel (E100) capability with electric-only propulsion by utilizing the advanced 2-mode hybrid system that General Motors is co-developing with DaimlerChrysler and BMW Group. GM also had its other upcoming two-mode hybrid SUV models on display. Ford also unveiled a plug-in series hybrid concept: the Ford Airstream. The Ford Airstream Concept is powered by a new hydrogen-electric plug-in hybrid drivetrain Ford calls the HySeries Drive. The Ford Airstream Concept can travel 25 miles in battery mode—depleting the battery’s state of charge to about 40%—before the fuel cell begins operating to recharge the vehicle’s 336-volt lithium-ion battery pack. Ford also introduced a Mustang-based E85 concept muscle car—the Ford Interceptor. The Ford Interceptor uses a Ford Racing 5.0-liter V-8 “Cammer” engine running on E85 (85% ethanol blend). Mazda announced it will begin selling its hybrid version of the Tribute SUV in the second quarter of the year. The Tribute is based on the Ford Escape. Toyota leaned toward power and performance at this show, introducing a crew-cab version of the Tundra full-size pickup with the promise of an E85 version of the Tundra to come, the Lexus IS-F high-performance luxury sedan and the Lexus LF-A high performance sports-car concept. On the hybrid side, Toyota showed its FT-HS hybrid sports car concept. DaimlerChrysler. MercedesBenz emphasized its Vision GL 420 BLUETEC Tier 2 Bin 5 full-size diesel SUV targeted for introduction in the US in 2008. The V8 diesel engine delivers 216 kW (290 hp) and generates 700 Nm (515 lb-ft) of torque, with an expected fuel consumption of 9.8 liters per 100 km (24 mpg). Detroit was also the venue for the US premiere of the new smart fortwo, also to be available in the US in 2008. The Chrysler Group introduced a Jeep Trailhawk BLUETEC concept vehicle, and announced it is offering its new mid-size Avenger sedan with a flex-fuel engine option. Honda also leaned into the high-performance sports car mode with its introduction of the V-10 Acura “Advanced Sports Car Concept. The company had on display its FCX Concept fuel cell vehicle, the basis for a production model still scheduled for introduction in 2008, and also unveiled the design of the next-generation Accord. Nissan unveiled an advanced design study, the Nissan Bevel Concept. A Bevel would feature a small, efficient 2.5-liter V6 combined with a hybrid drive unit. Volkswagen/Audi each had on display a Tier 2 Bin 5 BLUETEC diesel. Audi confirmed it will introduce its Q7 3.0-liter TDI SUV in the US in 2008 as well. The Q7 3.0 TDI will be Audi’s first model to showcase Tier 2 Bin 5 compliant BLUETEC technology. Volkswagen had on display its concept BLUETEC Tiguan introduced earlier at the Los Angeles Auto Show. Mitsubishi confirmed plans to develop a next-generation common rail turbo-diesel engine to be applied in a new Lancer in 2010. The Mitsubishi turbo-diesel announced at the NAIAS for the US will be based on the 2.0-liter, Euro-5 compliant engine that MMC is developing together with Mitsubishi Heavy Industries for the European market. The new engine will incorporate a Diesel Particulate Filter (DPF) and NOx trap catalyst system and will meet Tier 2 Bin 5 emissions requirements, according to Mitsubishi. Hyundai concentrated primarily on the introduction of its new Veracruz crossover, but also introduced the Helion—a three-door sport crossover powered by a 3.0-liter diesel engine. The following is a letter I sent yesterday to Ken Cohen, Vice President of Public Affairs for ExxonMobil, following up on a series of recent conversations between bloggers and Mr Cohen on ExxonMobil's position on climate change and allegations of their continued involvment with organizations seeking to prolong the debate on the science of climate change or impune the credibility of the IPCC 4th Assessment Report released yesterday [Part 1, 2 and 3]. Thank you very much for your quick response to my questions and concerns regarding the Guardian article on AEI and Exxon's involvement with their organization. Our continued dialogue has been very educational for me and I hope we all agree has elevated the level of discussion on these topics amongst the blogosphere. I very much appreciate you taking time to speak with us, and I will continue to extend you the courtesy of commenting on issues pertaining to ExxonMobil as they arise. I hope we can continue our open dialogue. In the past two conference calls, you have made it very clear that ExxonMobil's position on climate change is that we should no longer be debating the science, but rather discussing smart policy solutions to the threat posed by global warming. While the science will continue to be refined over time, you've made it clear that Exxon does not doubt that the climate is warming (and has warmed already), that CO2 levels are at their highest level in several hundred thousand years, and that human activities including the burning of fossil fuels are a major contributor to those CO2 levels and the resulting increase in global temperatures. This position was very much news to me, and I imagine to the other participants in our discussion (and our blogs' readers) as well. In fact, I had been under the impression, based on media reports such as today's Guardian article, that Exxon was still in a position of denial about global warming. In fact, this seems to be a very widespread and well-entrenched public opinion concerning ExxonMobil's position on climate change. To a degree, this could be blamed on certain media outlets, or on groups like Greenpeace (who you mentioned today), who may latch on to any indication that Exxon is involved with activities calling into question the scientific consensus on climate change without doing adequate reporting or getting comment from Exxon. I know from personal experience with the press that reporters often have their angle when they set out to write a story and may not look too hard for anyone or anything contradicting that angle. The same can clearly be said for bloggers who don't even have a professional code of journalism to adhere to. And yes, perhaps Greenpeace's fundraising efforts stand to benefit from having a convenient 'bad guy' out there to point to. Still, as I think we covered in our discussion today, if you don't want to be that 'bad guy' in the public's mind, it is also ExxonMobil's responsibility to make their true position clear if it is being consistently mis-reported in the press. And more specifically, it is your responsibility, as VP of Public Affairs for Exxon, to counteract any inaccuracies in press coverage of ExxonMobil. As you have now made us aware (that is, the participants in our discussions), ExxonMobil's official position on climate change, as published in various publicly available statements and reports, is that the question is not about the science, but about the appropriate policy response. However, that position has clearly not been received by the public or the media, and if your goal is to avoid being "put in the bucket" with those who seek to confuse the science of climate change and continue that weary debate, ExxonMobil must do a considerably better job at publicly clarifying their position on climate change. As Susan Smith pointed out, if you truly want to avoid being painted as being in a state of denial about climate change science, it would behoove you and ExxonMobil to actively attempt to distance yourselves from any organizations that might be engaged in such denial. From a PR perspective, this has now included AEI. Regardless of the veracity of the Guardian article, from a PR perspective, it must be clear that your continued funding of AEI has once again painted you in the public eye as a company engaged in activities designed to confuse the climate science discussion and continue what you have conceded is the wrong debate, detracting from efforts to move beyond debates about science and instead discuss smart policies. This is a very widely held and well entrenched public view, and one that you will need to make concerted efforts to undo. It will take much more than publicly available statements on your website. Without a concerted and very public effort to clarify your position, the public will continue to consider ExxonMobil one of the last climate change detractors. And this goes beyond simply clarifying your position. You must actively strive to maintain the consistency of that position. If you publicly clarify Exxon's position on climate change, yet continue to be linked to groups that are continuing to debate the science not the policy, than the perception will likely be that ExxonMobil is saying one thing while funding organizations that are saying another thing, maintaining a convenient level of deniability in the process. Let's be honest, Mr Cohen; we both know the public is not going to trust you easily, nor will they simply take your word for it at first that your company is truly committed to policy solutions and wants to see us move past debating the science. You are going to have to earn our trust, and that will take a concerted effort. If your goal as a company is truly to advance the discussion surrounding smart policy solutions to climate change, than it is in your interest to make that effort. Even if it is false, the public perception that ExxonMobil continues to deny the scientific consensus on climate change continues to mire us in the wrong debate, while hampering efforts to move beyond the science to discuss policy solutions. Thus, making a very public effort to clarify Exxon's position will go a long way towards clearing your clearly tarnished reputation while advancing the debate on policy solutions to climate change, a goal that we supposedly both share. To this end, I would suggest that Exxon make a very public announcement (on par with the USCAP press event last week) that it considers the scientific consensus on climate change to be adequate enough to begin a serious discussion on policy solutions. I would encourage Exxon to hold a press conference very soon to clarify your position and to publicly state that you are willing to testify to that effect before Congress and that you are very much interested in seeing Congress take policy action at the earliest practicable opportunity. You do not have to endorse a particular set of policy proposals, or a particular bill, if you are not ready to do so at this time, but doing so would lend credibility to the fact that this is something ExxonMobil is very serious about and is something you have given considerable thought to. I would also encourage you to publicly distance yourself from any organizations that could be perceived as further linking ExxonMobil to efforts to continue the scientific debate on climate change, so as to make your position appear as consistent as possible. The release of the IPCC report today makes this a very opportune moment to make such an announcement and to receive the press attention that you will need to begin to counteract the widespread public misperception of ExxonMobil's position on climate change. Counteracting that very public misperception will go a long way towards buoying Exxon's reputation and will help establish the credibility on this topic that your company will need if it wishes to become an active (and heeded) participant in the ongoing policy discussions concerning climate solutions. It will also be a significant help in advancing the public and political debate beyond questions of science and onto questions of policy, a goal you have repeatedly said you hold. I very much appreciate your candor and honesty on this topic, and I welcome continued dialogue in the future. And I hope to see ExxonMobil become publicly viewed as one among a growing list of companies seeking to see smart policy solutions to climate change. I hope we can agree that such an outcome would be in all of our best interests. Thank you again for your time. We'll see if Mr Cohen and ExxonMobil take any of this to heart. Hopefully we will see a big press release in the near future in which ExxonMobil very publicly states their belief that the scientific debate on climate change is over and that they now want to see an ernest discussion of smart policy solutions. I think that this will go a long way towards moving us forward towards implementing real climate solutions. Whether it's true or not, the fact that ExxonMobil is still publicly viewed as continuing the question the remarkably strong consensus on climate science continues to mire attempts to move past the science debate and onto discussing policies. The opinion of the largest corporation in the world, however self-interested they may be, still have quite a bit of weight, and the continued perception that Exxon is still in doubt about the science fuels the fire and provides more ammunition to those like Senator Inhofe (R-OK) who continue to challenge the scientific consensus and maintain that climate change is "a hoax." If ExxonMobil indeed truly wants to see Congress debating policy solutions, and not the science, then it's up to Mr Cohen and his PR department to make that very clear to the public and to Congress. The ball is in your court, Mr Cohen. What's your next move?